The theme of Professor Evan's book is the growth of a recognizable modern party system from the much looser and often family-based attachments of the eighteenth century. He examines the significance of the terms 'Whig' and 'Tory' in the later eighteenth century and the growth of a party aligment between 1788 and 1812 - a period in which war was a major factor in polarization. He discusses the years of Tory hegemony under Liverpool and the decline of the independent member, and then takes as his main themes the transition from Whigs to Liberals and from Tories to Conservatives in the period of 1830-46 which saw so much concern both with political reform and with social questions. He also examines the substantial growth of political organizations. 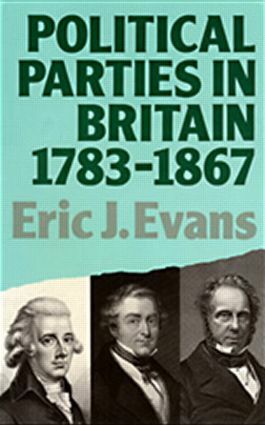 Professor Evans goes on to deal with the paradox that though the Tory party was shattered by the corn law crisis, the subsequent period to 1867 saw an increasing importance being attached to party allegiance. He also discusses the waning power of the Crown, the growing importance of general elections, and various areas of divergence between parties. Although the emphasis of this book is necessarily thematic, a firm sense of chronology is always maintained.